Present to my oldest brother for Christmas of 2003. Its profile reminds me of a classic 80s video game, and it uses two Russian tubes. Hence the name. The hours are two Russian IN-4 top view nixies, while the minutes are two side view ZM1032 nixies, made by Philips. All tubes are operated as bi-quinary nixies (5 cathodes, 2 anodes). Its a multiplexed clock driven by a Atmel 89C2051 μC. This is an 8051 variant. It has a DS1307 battery backed RTC, and has an hourly chime. The power supply generates -200V, which made circuit design simpler, since this clock has 8 anode drivers, and only 5 cathode drivers. This is due to multiplexing bi-quinary tubes. Input power is 9VAC, from which the 5V and -200V is derived. -200V is boosted using a MC34072 Op Amp based supply. Also the time is sync’d to the 60Hz AC line frequency. Warning: Avoid using the IN-4 Nixie. It is NOT mercury enhanced, so the life of the tube is only ~10,000 hours. 5000 hrs, if only a few digits are used, as in the 10-hours location. I’ve replaced the 10-hours digit, 3 times so far (as of mid 2011). Present to my mother for Christmas of 2003. Its an alarm clock. 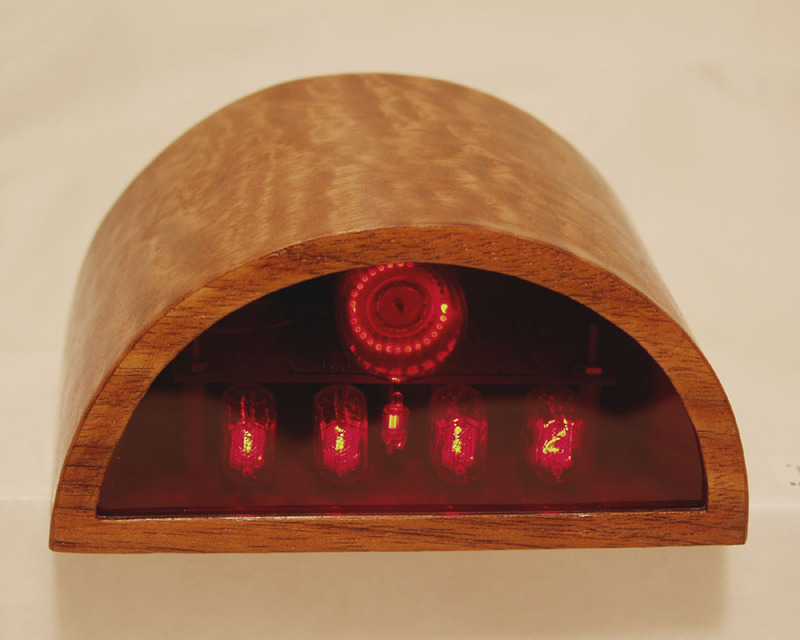 The nixie tubes are 4 Burroughs B5991 Oval (National 8422) nixies, with a Russian INS-1 neon bulb as a colon separator. It also features a GC10B dekatron, which acts as a visual pendulum, above the other tubes. The nixies are plugged into special decoder/driver sockets made by Burroughs under brand of Bipco. The clock is multiplexed. It is driven by an Atmel 89C2051 (8051 variant) μC, and has a DS1307 RTC. No chime, but a second alarm time can be set, which triggers a high pitch tone, upon reaching that time. Input power is 9VAC, from which the 5V, +200V(nixies), and +450V(dekatron) is derived. The HV boost supply (+200V & +450V) is based on 555 IC. Also the time is sync’d to the 60Hz AC line frequency. This clock was a birthday present to my second older brother in 2004. Its my first clock using an Atmel AVR mega8 μC. The tubes are 4 Russian IN-14 (mercury enhanced) nixies, a NE2 neon, and a Sylvania 6802 Dekatron. It also retains the DS1307 RTC, and hourly chime circuit. A new feature on this one, is upon bootup, it tests incoming power. Its measures the frequency, for 2 seconds. From this it can determine if its 50Hz, 60Hz, or DC. If its AC, it sync’s the the time on it, using proper scaling, if its 50 or 60Hz. If it sees DC, frequency of zero, it uses the 32KHz crystal from the RTC chip. It still uses a 555 timer based HV supply for +200V (nixies & neon), and +450V (dekatron). This clock was a present to a good friend of mine, in 2004.Its a 4-digit IN-17 clock kit from Moses. That kit uses an AVR mega8 μC, and has an on-board MAX1771 based HV power supply. Its operated at only 32KHz, but its a very precise 32KHz, from a MAXIM 32KHz TCXO. Instead of an RTC, the uC and TCXO, have a supercap, for battery backup. This back-up scheme keeps the time (while off) for several days. I added a 6802 dekatron pendulum on a separate board. The circuit driving the dekatron is based on an AVR tiny12, and also generates the 450V needed by the dekatron. Input power is 12VDC. This clock was a present to another good friend, in 2005. It uses 4 NL905 inverted nixie tubes, an INS-1 neon, and GC10B dekatron. The μC running it is an AVR mega8. The HV is generated from a MC34063 Switch-Mode Controller Chip, in the MKII configuration (complimentary push-pull transistors driving the FET). It has an hourly chime, and can detect if the incoming power is AC or DC, and adjust the timebase accordingly (see clock No. 3). The pendulum scheme has been altered to work as a second indicator. It still bounces back and forth (CW then CCW), but now the turn around point indicates the second. There’s an English 1953 Schilling coin between the white set buttons up on top. These were referred to as bobs. At the time this clock was made, my freind’s oldest daughter was seeing a fellow named Bob (not short for Robert; just Bob). This irked my friend, hence the name, to rub it in. A few years later, Bob became his 1st son-in-law, and ended up being a really likeable fellow. So much so, that now my friend’s wife (Bob’s mother-in-law) tells her daughter (Bob’s wife), that if they ever get a divorce, they’re keeping Bob. The son-in-law, not the clock. 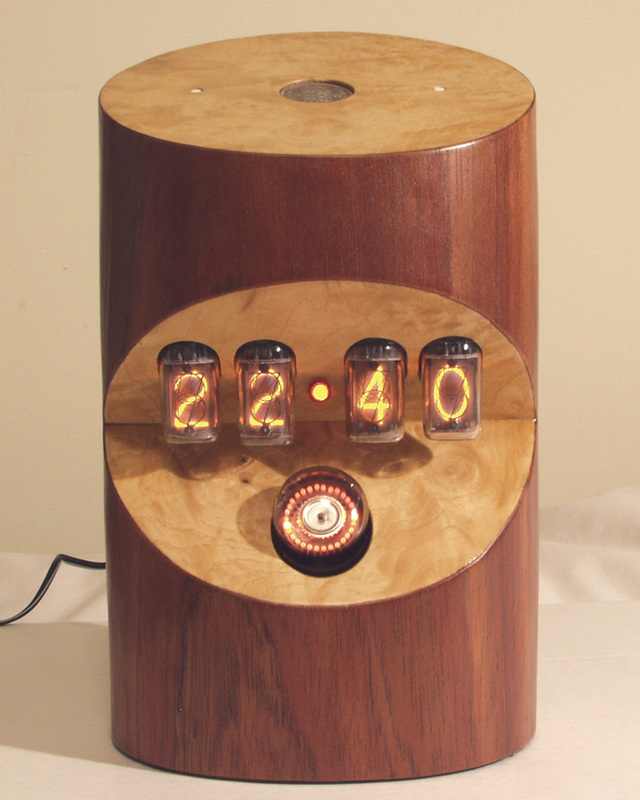 The first nixie clock that I’ve made in over 10-years, after that last bunch ! This one uses my NC5A kit. 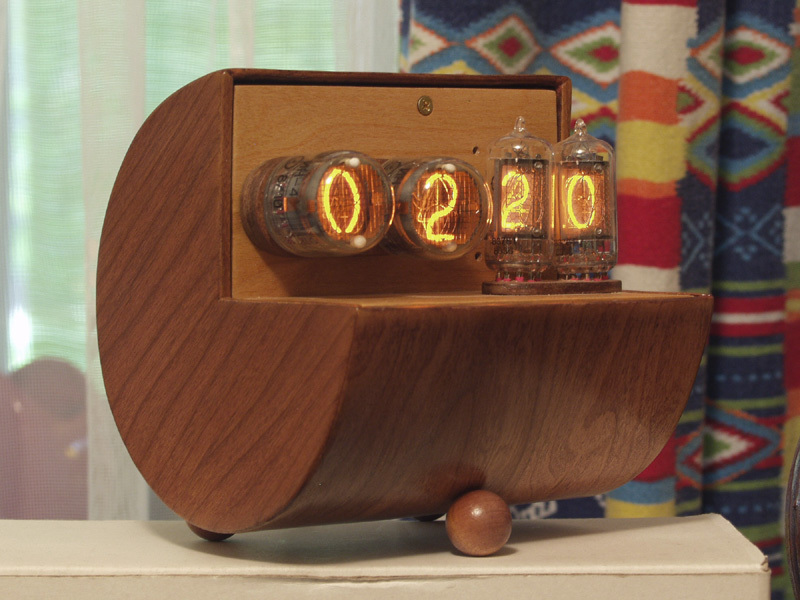 It made of Burroughs B6091 nixie tubes, which have 0.8″ high digits. The dekatron is a British Ericsson GS10H. This is similar in size to a Z504S, but has a 17-pin base, as opposed to the Z504S 13-pin base. Fortunately, the socket, came with the tube. The clock Body measures a little over a foot, in diameter. Still using my NC5C kit, here is another clock that uses 2 different types of nixies. The hours and minute digits are IN-18 Russian nixie tubes, date code indicating made in 1990. The two smaller nixies, for the seconds, are Burroughs B5991 (same as National NL8422) end view nixies, made in 1974. The dekatron is an Amperex (Philips) Z504S. Instead of using the on-board HV supply, it uses a plug-in (into P5) PS6A (surface mount equivalent of the NK01A) . The anode resistors for the hours and minutes are 4.7K, while the seconds still use the 10K value, indicated on the silkscreen. The colon is only real departure from the base design. The colon is 1/4″ clear acrylic rod, that has two roughened ring sections in the middle. An orange superbrite LED is glued at its bottom shining light upwards. Light gets emitted at the roughened spots, forming the colon, between hours and minutes. To accommodate the LED, Q17 was changed from an MPSA42 to a 2N4401. Q18 and R35 are omitted. R36 was reduced to a 470 ohm resistor, limiting the LED current to ~8.5mA. Other than that, its pretty much a stock kit. No sockets visible. For the seconds (B5991) tubes, and the dekatron, there are sockets, but they are mounted on a sub-panel 3/4″ behind the recessed face. The sockets for the B5991s came with the tubes. The B13B socket for the Z504S are still available, and currently made in China. The IN-18s, however, are not socketed. They are wired according to my improvised socket method. This allows the pins to float, avoiding stress that may break the glass envelopes of those tubes.